Designed with safety in mind, the KCT-387 has cutting functions like any utility knife with the added protection for the working hand and fingers. A safety guard is placed under the fingers to protect them from the rough working surface. Innovation never continues to cease when it comes to tools and their safety. This knife is contoured for phenomenal grip, control and safety. A push button near the nose allows for quick and easy blade changes Use to cut paper, cardboard, leather, drywall, plastic sheeting, and other materials. Utility knives have been around for many years. Based on the users’ needs, they continue to evolve with new features such as folding knives, auto-retractable blades, and comfort grips. 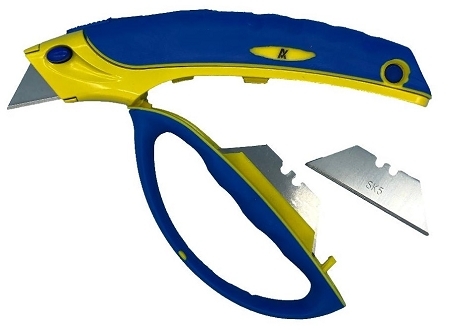 With additional safety the KCT-387 can be used for a variety of cutting applications. The best utility knife I use and my partner. 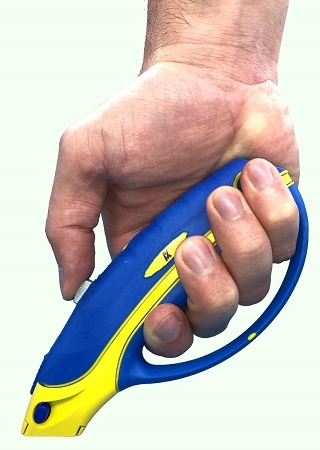 The safe guard really help us speed up the work without worry scratch our finger or knuckle. The quick remove knife folders is a big plus. it does save time; run to tool bag find the blades.